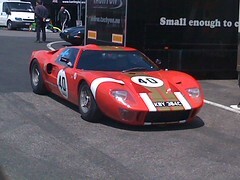 That is what I thought as I watched the GT39’s and GT40’s. 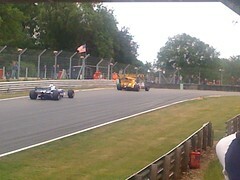 That is what I thought as the Lotus chased down the Tyrell – as the Cooper followed BRM. That is what I thought as I watched the McLaren pass the Porsche and the Chevron inch past me as I walked my way through the paddock. That is what I thought as the driver of the #08 GT39 spoke to me about the fluid leaking from his callipers and intracacies of getting oneself in and out of a car that stood no more than 39 inches off the ground. 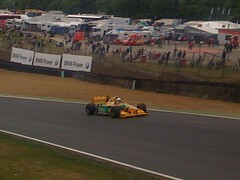 The location was Brands Hatch in Kent. The weather was amazing! Whilst I was aware it was May 27th, 2012 – the exhibition on show easily transported me back through the ages; pre 1966, post 1971 – an age when motorsport was unbelievably evocative. 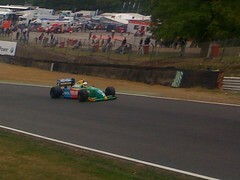 I stood inside the hairpin at Druids, I walked along the fencing from Paddock. 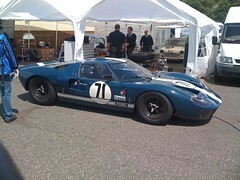 I gazed off towards Graham Hill bend and listened as the cars howled into Clearways. In an era when sports have become further and further removed from those that make up the fanbase, I urge any and everyone who has the opportunity – get down to your local circuit any time you have the chance to get up close and personal with the legendary machinery of a bygone era. It’s been a long time coming; over 20 years in fact, but with Kenny Dalglish now firmly in place once again, as manager of Liverpool FC, I feel assuredly confident in saying a change is gonna come. When Liverpool FC last lifted the trophy for winning the league, before the birth of the Premier League, no Red watching ever considered that we would then have to endure such a barren spell without league success; not at this, England’s most successful, ever, at the time, football club. Yet here we are, over two decades later, hoping, some praying, that we are finally building towards something special. That we finally have in place a structure and squad that will stay the course of a championship run. Our owners seem to have a sense of purpose; a vision of how a successful club (franchise) should be run. Our manager has an innate understanding of what it will take to re-establish our club as title contenders, as potential number ones. Our coaching staff and backroom staff are all accomplished in their fields, whilst being resolute in their desire to work together, as one, to deliver what every man, woman and child connected to this great club ultimately wants. And our players, our squad, has been refreshed; revived; revised and reshaped to be a more formidable unit whether we are playing away or at home. Liverpool FC are not the finished article, not yet, not completely. But when you look at our opponents; the other protagonists involved in this great contest, who could you say has a ‘better’ squad; a more complete squad; a more motivated squad; a more cohesive squad or a more exciting squad than the one that calls Anfield it’s home? Who could you say is without their own challenges; their own obstacles to overcome? So I ask you – why not? Why should this not be our opportunity to bring Liverpool FC back in from the cold? With grudging respect, we have had to acknowledge that Manchester United have stood as giants at the top of English football for far, far, too long. So I say to you all, on the day we wish a happy birthday to the great man who started it all – I feel confident that a change is gonna come. It was something I just had to do! The Senna movie, something that had been heralded for quite some time, was showing at my local cinema and I just happened to have the day off work. The temptation and opportunity were all to compelling to ignore; no nattering children; a screening time when most people would still be at work, all resulting in an empty theatre and a viewing experience I did not have to share with anyone else. Well, no-one else other than the other guy, sat two rows back, who unfortunately had the same idea as I did. So there I sat, huge back of sweets on my lap; the kind that cost a small fortune, with my smartphone close at hand – WordPress App open, ready to record my every thought, my every emotion. It is important to note that using a phone whilst at the cinema is a major no-no – it is poor etiquette, the kind of activity that is likely to irritate anyone sat behind you – as their gaze will constantly be drawn away from the screen towards that irritating glow. However, with only me and sweet chomping guy there, I had no-one to annoy. I had no expectations of the film, save the obvious wish to know more about what happened on that fatal weekend at Imola. I remembered the race weekend as though it were yesterday; the terrifying accident of Rubens Barrichello, the tragic sequence of events that lead to the first death in Formula One in over a decade, a death that shattered the belief that F1 had become safe, instead of just ‘safer’. A death that wrenched the heart of any and everyone associated with the sport; competitors, teams, media and fans alike. And just as the world of motor sport reeled at the death of Roland Ratzenberger, someone constantly acknowledged as one of the nicest guys in the paddock, we had the start-line accident that ultimately ended the Formula One career of JJ Lehto and hurled an errant wheel into a horrified crowd. And after this, after we thought we had endured the absolute worst weekend in recent Formula One history, the weekend blackened even further with the tragic death of Ayrton Senna ; compounding the hurt, the anger and the futile sense of loss. I wasn’t a fan of Senna’s, as he was the nemesis to my childhood hero, Nigel Mansell, but I was abundantly aware of the enigmatic impact he had on the sport – it would have been impossible not to have understood that effect. His death left a vacuum in people’s hearts; regardless of their opinion on him as a man, they all knew, we all knew he was one of the most talented individuals to ever grace the sport – someone whose impact, accolades and achievements you believed were very unlikely to be superseded by anyone for quite some time to come. And so I sat, awaiting the emotional roller-coaster that would attempt to remind me and sweet chomping guy of the precocious talent we had lost; the controversial character he had been and the levels others would have to reach to truly rest from him his crown. When it came to being reminded of key protagonists to Senna I recalled just how much I had despised Senna’s rival, Alain Prost. No matter how much I disliked Mansell losing out on a duel to the mercurial Brazilian, I was even more enraged when I considered how he was undermined by the Frenchman when they shared a garage when they both drove for the prancing horse. The 1980’s, politics ruled the sport then, just as much, if not much more than it does now. Watching the Senna movie brought the memories flooding back; Mansell versus Piquet at Williams; Senna versus Prost at McLaren, Jean-Marie Balestre seemingly conspiring against them all. Watching also reinforced, for me at least, the similarities that so many observers and followers of the sport see between the character that was Ayrton Senna and the man who idolised him as a young boy, the potentially equally talented and oft-times sensational Lewis Hamilton. Just like Senna in his day, Lewis divides opinion amongst the fans; those who love him and those who don’t. What they can all, mostly all, agree upon, as with Senna, is that Hamilton is one of the most outstanding and naturally talented, some would say gifted, drivers to ever grace the sport. I have deliberately avoided detailing the movie in any depth, as I feel it is something you should experience for yourself and I do not wish to provide any spoilers, but I will say that it left me with a feeling of immense loss. Not just the loss of Senna and Ratzenberger, but the loss of an era in the sport when the drivers spoke their minds, regardless of the name of the sponsor emblazoned across their shirts. If you get the chance, if the moment should present itself to you – I wholeheartedly recommend that you take the time out of your day to remember one of the most defining characters in the entire history of Formula One. Twitter: It’s all about being Red! I was slow to realise the benefits of the social media revolution. To be more accurate, my constant need to swim against the tide meant I was predisposed to despise the idea of anything that would make me a social lemming; just another mindless fool swept up in the hype of the Facebook phenomenon taking over the world. If you have been kind enough (bored enough) to read through my other blog posts, you will know just how much of a challenge I can sometimes (always) find socialising to be. So I am going to assume that you can understand why the idea of opening up via the medium of Facebook might make me break out in hives. I have a Facebook account though, created out of duress and with the sole intent of ticking the box and pretty much getting people to stop hounding me to join and leave me the hell alone. Someone kindly pointed out to me the irony of my stance and the fact that I might well be the most anti-social person on the worlds largest (at that time) social media site. When I needed a portal to tap into, a source of information to keep me up-to-date on the minute by minute events of the ousting of Hicks & Gillett, I found myself signing up to Twitter, only to find that Liverpool FC fans from around the globe were also flocking to Twitter in their droves. From the steps of the High Court London to the pews of a Dallas Court House, Liverpool FC fans Tweeted every twist and turn of what those parasitic owners from hell would later label a massive swindle. And from that spark of interaction followed an overwhelming need in me, no – desire, to stay in touch and maintain that vital link with what I truly believe is one of the greatest fan-bases on earth. From the highs of ousting Hicks & Gillett to the lows of the Hodgson era, we Tweeted through the day, night and into the earliest of hours. As the media goaded and rebuked us for deigning to disagree with their most esteemed opinions on who should lead our club, we rallied and stood fast – determined that the destiny of the club we all love would not be shaped by those without any clue of what it means to hold Liverpool FC dear to their heart. The same media that condescended would trawl the time-lines and take the pulse of the global Kop, sourcing a byline for back-page stories to tell the footballing world and beyond of the discontent in our ranks, the turmoil engulfing our club. And then came the return of the king. FSG, who also have a substantial presence on Twitter through the various accounts of NESN, John W Henry and the ever increasingly passionate Red – Linda Pizzuti, gave us all the Christmas present we wanted – by appointing Kenny Dalglish as Care-Taker Manager; a move that, in one fell swoop, re-united the Kop, pulled the LFC fan-base together in a fashion that no other appointment could ever have accomplished and gave us back our hope. And through it all, we Tweeted and engaged. Interacted and grew stronger. Liverpool fans all around the globe rejoiced at once and sent Twitter into free-fall. We broke it once again on transfer deadline day, for those of you who hadn’t noticed. Interaction with other Reds on Twitter continues to provide me with an ever-increasing pool of knowledge to tap in to, a constant source of banter and debate and the chance to share my hopes and dreams for the seasons ahead with other like-minded individuals. And so I think about Twitter, and it’s purpose in the modern-day world, and I can’t help but come to the conclusion that Twitter isn’t just about 140 characters, about putting your thoughts out there for others and having them read. No – for me, this social phenomenon is all about your 140 characters, about getting your thoughts out there for others and them being Red! 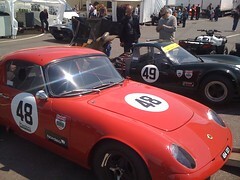 A few years ago, I decided to take in the Masters Series Racing event at Brands Hatch; a three-day festival of speed, sound and octane. I had convinced my brothers and a friend that it would be an amazing day out, that we would be able to get up close and personal with some of the most iconic cars to grace the track. 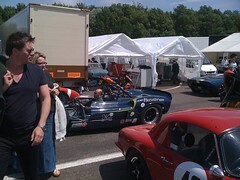 So we bought our tickets and made our way to the circuit. We found a great spot to watch the cars as they came around Paddock Hill Bend, holding on to the track surface with what seemed to be the faintest hint of grip, and then stood enthralled as they raced up to meet us on the other side of the fence at Druids. And then the rain came! Sorry, did I not mention that it had been on a Bank Holiday weekend? No? Well – it was a Bank Holiday weekend and it was wet. The rain fell and fell with no sign of relief from the cold and no indication that we would ever be dry again. The cars in the wet were a joy to behold, but the day out was an anticlimax and the dream weekend came to a disappointing end. So you can imagine my apprehension when, again, I decided in my infinite wisdom to make the pilgrimage back to Brands Hatch yet again. Another Bank Holiday, another Masters Series Racing weekend and another opportunity to be soaked to bone – drenched. However, this time around, quite unusually for a British Bank Holiday, the rain never came. 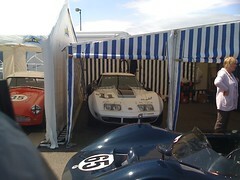 There was I, water-proof clothing in the boot of the car, and not a drop of water in the sky – just wonderful rays of glorious sunshine; rays that danced off the gleaming skins of the cars on show and helped to ensure it was the weekend I had always dreamed it would be. 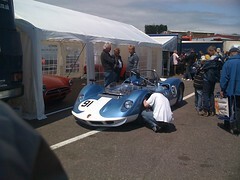 The cars on show were from an era when motor racing was a less sterile affair. A period in time when it was all about horse-power and less about the aerodynamics that proliferate motor-racing of the modern era. As the cars raced around the Brands Hatch circuit, one that is cradled in a natural amphitheatre, the sounds of V12 engines created a cacophony of sound that provided the perfect backdrop to what became quite an emotional affair. As my brother and I stood in the same spot we had occupied on our previous visit to Brands we noticed that there was a bridge that allowed you to cross the track just before Druids, so you could stand inside the hairpin and watch the cars as they made the run down to Graham Hill Bend. How had we not noticed this before? Well, that would probably be due to the fact we had been unable to see it through the driving rain the last time we came. But as it was the brightest of days this time around, we had seen our opportunity and had taken it – an opportunity to get up close and personal with the cars screaming by at full pelt. There were Ford GT’s, TVR’s, Aston Martin’s Austin Healey’s and one of my personal favourites, the Shelby Cobra – a muscle car from a bygone age of evocative motor-racing legend. 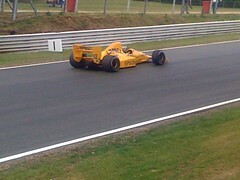 And just when I thought the event could not possibly get any better, the Formula One cars took to the track again. But this time, it wasn’t just the cars of the 60’s and 70’s – this time we had demonstration laps of cars that had once been driven by Damon Hill, Michael Schumacher, Nelson Piquet and other house-hold names. The entire day was quite simply, unbelievable – none more so that when I walked through the paddock area mere inches from the cars that had previously been racing on track during the day’s events. At that point I realised just how sterile modern Formula One has become and why events such as the Masters Series Racing will always make me long for that bygone age; the age when the fans, the public, could walk up to the drivers in the paddock, touch the cars and feel part of the event. They say you can choose your friends but not your family. That there is a certain level of control you can exert when you select those with whom you would wish to share your hopes and dreams; a level of influence that is beyond you when fate goes about dictating the genetic line to which you will belong. However, when it comes to the disparate individuals that come together in the name of support, under the collective banner of fandom, those particular lines of delineation can become quite blurred; the definition of what is friend or family becoming unclear. Whether you are a member of the Red Sox Nation, a Kopite to the core or stand together to try to diffuse the racial taunts of opposition fans, as do those who follow Spurs – football fans for generations have felt a calling; a sense of belonging that many in fact trace back to the time of their birth. Whether it be a conscious choice of affiliation or one born through osmosis – football fans consider fellow supporters family, friends and so much more. Through times of trial or tribulation, in times of joy or hope – the ties that bind one supporter to another can serve to provide a sense of fulfilment, understanding and acceptance that make the hardships easier to endure; the moments of ecstasy far exceed those that came before. So as we look back on the 22nd anniversary of the Hillsborough Disaster; a tragic event that to this day binds supporters of Liverpool FC together as a family fighting for justice, I ask for all members of that extended football family to watch United this weekend, to watch David Tennant bring to life another tragic moment in football, a heart-breaking event that bound another fan-base together in their own cause. For although one group of supporters may have no love for another, we can all surely understand the pain and hurt United fans have endured; a pain and sense of loss that no family deserves. So, just like those distant cousins you never see and perhaps would rather not acknowledge – we should all put aside our divisions this weekend, our animosity for our footballing foes. We should watch United – we should reach out to their fan-base as they remember their loss. Because, even though it may pain us to admit it, even though it is an association we might not choose or would rather ignore – as fans of football, we belong to the same extended family after all.